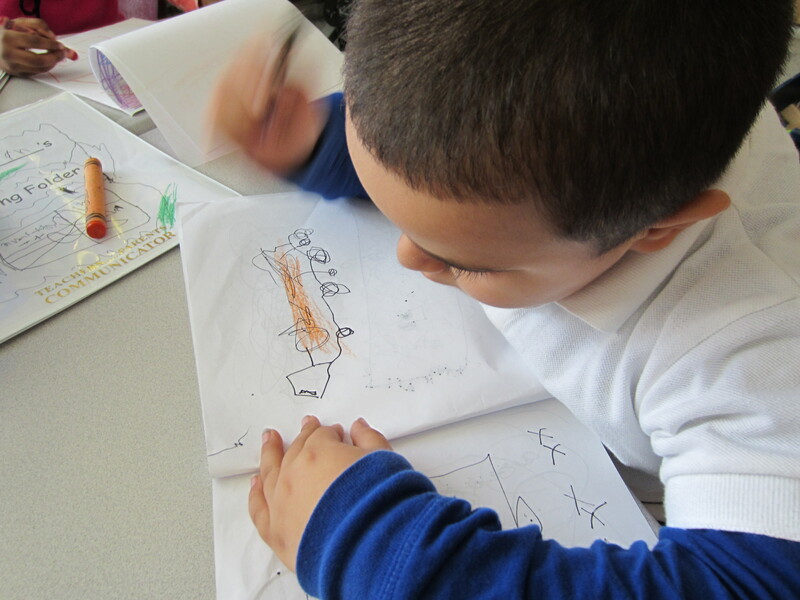 Friday was the 9th day of school – and the 9th day of Writer’s Workshop in our kindergarten classroom. We make books every day after lunch, a routine that was established on the very first day of school. Our Writer’s Workshop begins by reading or revisiting a book and talking about the author. I introduced David Shannon as the first author we studied. We read No, David! and I shared the author’s note on the inside cover where David talks about how he got the idea for this book. I sent my 4 and 5 year olds off with 5 pages of stapled, blank pieces of paper to “make books, just like David Shannon!” Every single one of my kindergarteners then proceeded to make a book – and many complained when I called them back to the rug after 30 minutes of writing time. I had to reassure them that we would have time tomorrow and every day to write. We shared our books then – princess books, dinosaur books, truck books, kitten books, cowboy books – all of the children had chosen a different topic and made a book about the topic that was important to them. If I didn’t know better, I would say it was magic. How is your Writer’s Workshop going? What ways do you help your students create an identity as a writer? I will be meeting with kindergarten teachers on Monday and I will be reading your post to them. Thank you for being a voice with this same message I bring to teachers, but they look at me with doubt when I tell them their students can make books. This post came at just the right time. Thank you! I’m so glad it is helpful! Have you read Already Ready by Katie Wood Ray and Matt Glover? It is a wonderful book for kindergarten teachers. I highly recommend it if you are starting to look at making books. I love that Katie begins her writing workshop on DAY 1! So many teachers tell me they have to wait til midyear when kids know more letters and sounds. Katie, you understand what Kinder writing can be and accept it for what it is. Others should know that your school has an extremely diverse population. They don’t all come with L/S and a bank of words in place. Love working with you, writing partner! Thanks Pat. And yes, many (if not most) of our books are pictures only at this point in the year. Some have strings of letters, a few have some words. But ALL of them can “read” their book when I ask them to read it to me or the class. (and I always begin a conference or sharing session with “read your book to me, please”. I love hearing their voices as they read the pictures, letters or words – whatever they are reading at that moment. They are 4 or 5 years old AND they are writers. I also do wws everyday in my k-5 class starting on day 1. It’s my favorite part of the day and is usually my kids, too! Did you mean that you start every mini lesson everyday with a read aloud or a revisit to a book? I dont always use a book during my mini lessons but this may need to be something I revisit. Yes, I would say 99% of my Writer’s Workshops start with a read aloud – either a new one, a reread, or looking at specific parts in books that we want to focus on (for example, looking at how different authors use speech bubbles). I find that starting this way, with the language of “this might be something that you want to try in your writing today”, really helps my writers try new things and, as Katie Wood Ray says, “stand on the shoulders” of authors we love. Kindergarteners are great authors. You are right. They come with great stories. As teachers, we just need to let them begin writing them on day one. Yeah for you. Katie, this is fantastic. Really fantastic. I love how simple you make it for others teachers to follow. Creating authentic authors from day one is very powerful. Thanks for sharing your story. I also feel like our K wrtg workshop is magic, but I’m also spending a lot of time reading books from authors who really help our young writers see the possibilities for themselves as writers. We had a terrible storm here the first night of school and the kids had so many stories we just had to make books about them! Franklin’s Thunderstorm and Mo Willems’ We Want to Go Out helped us to grow our own stories the next few days and we are off and running! Thank you for all your posts I learn so much everytime! This is what Kindergarten should look like! LOVE it!